The Intelligent Rail Summit takes place at Clarion Hotel & Congress Malmö Live in Malmö, Sweden. The venue of the conference is part of a hotel. You can book a standard hotel room for approximately €130 (incl. VAT) by contacting the booking department mentioning the booking code: 2107GR023277. You can also call them on: +4640 207500. Malmö is close to Denmark and Copenhagen. We therefore advise you to take a flight to Copenhagen Airport and from there take the direct train to Malmö via the Øresund Bridge. Taking the train from Copenhagen Airport to Malmö only takes 35 minutes across the famous Øresund Bridge. The Øresund Bridge is an approximately 16 km long road and rail link between Sweden and Denmark. But it is much more than that. The Øresund Bridge has created a region with a population of 3.7 million inhabitants. The train departs at Copenhagen Kastrup Airport every 20 minutes and arrives at Malmö Central Train Station. You can purchase your ticket locally or order flexible train passes for Denmark and Sweden at RailEurope.com before you travel so you don’t have to worry about getting tickets. 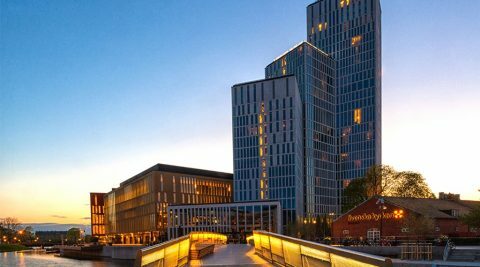 The Clarion Hotel & Congress Malmö Live is a 10 minute walk from Malmö Central Train Station.